Gaffers, grips, best boys, electricians, DPs, cinematographers, camera operators and other production professionals in the film, TV and theater industry rely on a variety of tools on set and on location to make their job easier. One valuable tool among these is the classic C-47 clothespin, which can really come in handy when you're doing simple jobs, such as attaching diffusion and gel filters to barn doors. 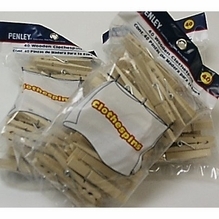 Although small, these versatile clothespins are an on-set must-have. Clothespins are also a handy and quick on-set tool for attaching light weight fabrics like duvetyne to window rods to adjust lighting. BarnDoor Lighting Outfitters carries economical packs of C-47s for all your film, video, TV, stage and photo production needs. Pick up a convenient 40-pack to toss in your on-location bag or keep a well-stocked selection on set. Have questions? We'll provide one-on-one advice to help you make the right purchase. Give us a call at 1-888-276-3667 or e-mail info@barndoorlighting.com.